I can’t believe more musicians aren’t doing this. The truth is that you could be earning a lot more than you are. But first, you must give people the opportunity to spend more with you. Seriously. 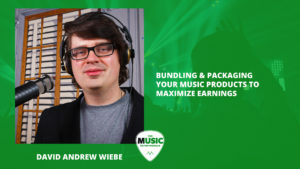 In this episode of The New Music Industry Podcast, I explain how you can create bundles and packages your fans will eat up. You know, it’s interesting. 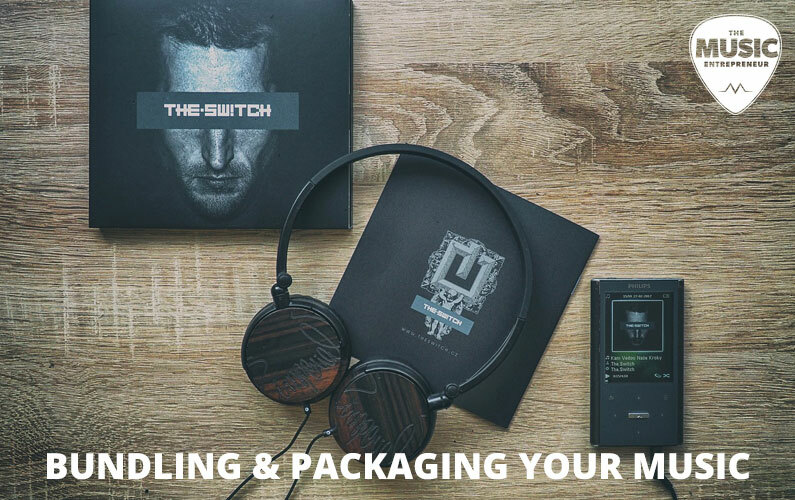 I was doing a bit of looking around online, and I found that there wasn’t much on this topic of bundling and packaging your music products together. It’s a good way to leverage what you’ve already created and make more money from it without reinventing the wheel and creating something from scratch. I’m sure there’s some stuff out there about this, but not much that I could find, so it’s a topic that I felt needed to be covered in more detail. So, I’m going to offer some tips here for you, and I think you’ll find you can do a lot with the music that you’ve already created without making a lot more, unless you don’t have much of a back catalog. What you may not know is that there are people willing to spend upwards of $100 or even $200 with you [in one sitting]. You just need to give them the opportunity, because they have that money, and they want to be able to support you if they like your work. You’re just not giving them the opportunity. Let’s say, for example, that you released five albums. Well, that’s great, people might be able to spend $50 to $60 with you to buy those albums, but you’re not giving them the opportunity to spend more. Why is that? I think that’s often an issue of self-confidence. So, you need to improve your self-image and know that you’re worth more, and know that you can get more. So, as I’ve already said, you can repurpose your back catalog if you have one, starting at about three or four albums. Any less than that, and you may not have enough content to create a worthwhile bundle. But after that point, you’ve got plenty to work with. Here’s a very simple way to get started with packaging up your music product. One is to offer a bundle of all your albums, and it should be for a fair price. So, let’s say you’re offering four albums in a single bundle, and normally it would cost people about $50, then you might want to discount it and set it at about $40, but that’s one opportunity most artists are not leveraging at all. And for those of you who want to take it to the next level, you can offer things like physical merch, your T-shirts, your buttons, your stickers, and things like that and put them in the bundle. The one problem with offering merch items like that and including them in your bundle is just fulfillment. You’re going to have to package it all up and ship it all out, and go to the post office, unless you already have a company or individual handling that for you. So, there’s a lot you can do without including physical merchandise. Now, I’m not saying that it’s a bad ideal to include a combination of physical and digital merchandise, because that’s also a great opportunity, but here are some other ideas you can try. One is to include handwritten lyrics, you can simply scan them and include them in your bundle. You could include transcriptions of your music, and even guitar tabs. You can get this done for cheap these days, and this is a missed opportunity, and artists like David Nevue have been doing this for a while, and have been successful at selling sheet music. So, I don’t see why you couldn’t do that too. You could include a story behind each album and the creation of it. You could include behind-the-scenes footage in video, or acoustic versions of the songs. You could create a short book or eBook that ties together your entire catalog. There might be some benefits to creating a physical copy of your book and selling it on places like Amazon simply because that could be a new revenue stream for you. And you even don’t have to create something that’s 40,000 to 60,000 words long. It can literally be 10,000 words, and people don’t have a lot of time to read anyway, and if it’s compelling, 10,000 words is more than enough to capture people’s attention. Now, if you’re not much of a writer, that’s fine, but you can also hire writers. There a lot of places you can go, like Upwork, to get somebody to do that for you, and you won’t spend an arm and a leg to do it, so that’s just an excuse. Now if you think this whole business of packaging and bundling your music is a good idea and it’s something that you want to pursue and do, then you should plan for future bundles and packages. Create as much content as you can. Save all your notes. Save all your blueprints and your marketing plan, and everything else you create around your music and then throw it in your package. Whatever is appropriate, whatever your audience might see as a bonus they would love. Just throw it all in there, and you’ve got a bunch of content you can sell. So, how do you do this, and how do you make it all possible? Well, my main recommendation is Gumroad, because they let you sell digital products, physical products, memberships, subscription products, pretty much anything that you’d want to sell online you can sell through Gumroad. Another great place that you can use is Sellfy. This is an online marketplace, so it can help you gain more visibility for your products. But the thing is, you’re still going to have to market your music no matter where you publish it. I don’t care if it’s Gumroad, Sellfy, or iTunes. You’re going to have to take some time to market and promote it and direct your fans to it to get sales. So, don’t just rely on a site like Sellfy to do your all your work for you, even though it will help you get more exposure for your products. So, what are your thoughts on bundling and packaging your music products to maximize your earnings? Do you think it’s a good idea? Do you think it’s a bad idea? Is it something you’re going to try? And if it is something you’re going to try, I want to hear about it. So, leave a comment in the show notes and let me know what you’ve been up to and what the results have been.